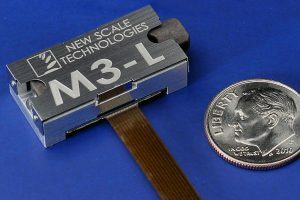 The M3-L is a miniature high-resolution positioning system. It is a “smart” actuator with integrated driver and closed-loop controller inside the actuator. This compact, powerful motion system helps OEM designers improve performance and reduce the size of instruments in a wide range of applications. M3-L micro linear actuators add high-resolution positioning to portable and hand-held devices. They accept a 3.3 V supply and high-level input via standard serial interface. We offer production-ready standard modules, as well as customized modules to fit your OEM application. Small: complete, compact system with embedded closed-loop controls. Less than half the size and one-fourth the weight of comparable systems. NO external control board is needed. Precise: 0.5μm position resolution with six millimeters of travel. Low voltage, low power use: runs on 3.3V input, holds position with power off. Simple system integration: accepts high-level motion commands DIRECTLY from your system processor, over standard serial interface (I2C or SPI). Flexible system, fast time to market: the M3 platform is designed for rapid customization. Modules are configurable for single- or multi-axis motion and travel up to 20 mm. The M3-L is ideal for precision tuning of optical and photonics systems. Defense applications include laser beam steering and targeting, UAV and UGV flight controls, and field-portable systems for biomedical and chemical detection and analysis. Medical applications include micro surgical devices and point-of-care systems. APPLICATION VIDEO | This video demonstrates the use of the M3-L micro linear actuator for laser beam control and for tuning high-powered RF and microwave systems. CUSTOMER APPLICATION | A new paper describes a high-Q tunable bandpass filter machined from plastic, using the M3-L micro linear actuator for tuning. The prototype is a precursor to mass production of low-cost, high-performance microwave devices for future 5G networks. Learn more. The M3-L is a linear actuator and requires careful attention to loading under static and dynamic conditions. More information including integration guide and CAD file are available for download (registration required). If you are developing or buying a translation stage to use with the M3-L actuator, consider the M3-LS Linear Smart Stage instead. This precision microstage has very high lateral stability, very low and uniform friction, and built-in absolute encoding. The actuator and controller are built into the stage for smallest size and optimal performance. 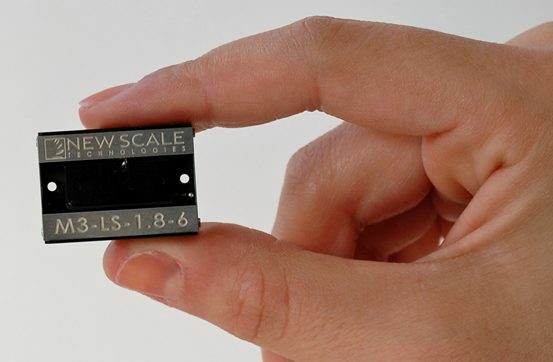 New Scale offers both standard and custom M3-L Linear Actuators. In addition to bi-directional (push/pull) systems and custom tips, we can create systems to address your requirements for travel range, module size, force, environmental conditions and more. Learn more about our custom engineering services. If you are developing or buying a translation stage to use with the M3-L actuator, consider the M3-LS Linear Smart Stage instead. 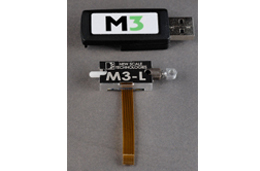 M3-L developer’s kits provide convenient evaluation of the M3-L system and prototyping for your design. VIDEO | The M3-L developer’s kit includes an M3-L micro linear actuator that operates on 3.3V and high-level input commands via SPI interface. M3-L developer’s kits include one M3-L linear actuator and a USB adapter to convert high-level computer commands into SPI commands for the actuator’s embedded controller. Standard bullet nose (push) and eye end (pull) tips are included. 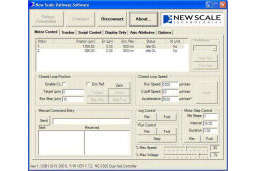 New Scale Pathway™ software lets you easily evaluate the micro linear actuator and validate your embedded software. Control multiple actuators from one PC screen. Developer’s kit including M3-L actuator, “push” and “pull” ends, USB adapter (SPI), connecting cables, mounting hardware and New Scale Pathway software. Contact us for custom or high-volume requirements. The following specifications refer to the Developer’s Kit module. We customize production modules to your OEM specifications. * Power depends on input voltage, speed and load. The M3-L micro linear actuator has an integrated SQUIGGLE motor and controller inside the compact housing. The motor moves a mechanical assembly. The NSE-5310 position sensor detects the movement of a multi-pole magnetic strip attached to the moving mechanical assembly, and provides the direct digital position information to the motion control processor. The on-board NSD motor drive ASIC accepts commands from the processor and drives the motor. System input is provided as high-level commands from the system microprocessor via standard I2C or SPI serial interface. NO EXTERNAL CONTROL BOARD IS NEEDED. The M3-L linear actuator operates on standard 3.3 V battery power.